There's a McDondald's Caramello McFlurry available. Run. McDonald's just released a Caramello McFlurry so you better put on your stretchy pants. 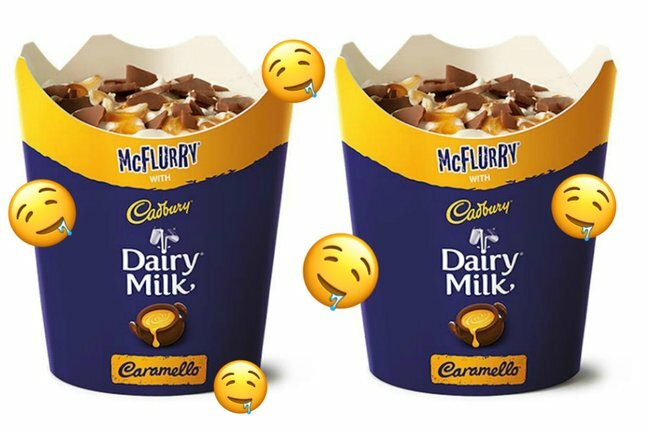 In very important ice cream news (AKA the most important news there is), McDondald’s has launched a Caramello McFlurry. And never have we realised something was missing in our lives more than this exact moment. We don’t know what we did to deserve such a glorious marriage of treats, but to the fast food lords above, we thank you. While a surprising amount of people were salty after the release of a McPickle burger turned out to be an April Fool’s prank (no judgement, pickle lovers), we’d say this lands Macca’s back in Australia’s good books. The Dairy Milk Caramello limited edition flavour joins its McFlurry sisters Oreo and M&Ms on the Macca’s dessert menu, and while we hate to play favourites, it’s sounding pretty damn delightful right about now. Gooey swirls of caramel and chunks of silky Cadbury chocolate embedded in soft serve? Yes please. Excuse us while we wipe our keyboards dry. …But because it’s a cruel, cruel world and all good things must come to an end (RIP shaker fries), they’re only around for a limited time.